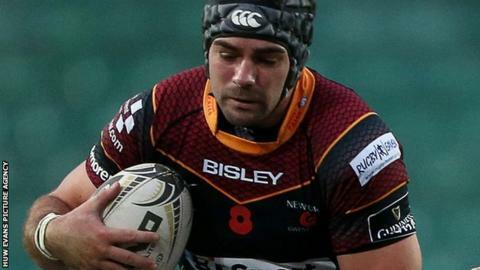 Newport Gwent Dragons centre Adam Hughes has re-signed for the region on a permanent contract until 2018 after initially joining on loan. Hughes, 25, has started every game since returning to Rodney Parade in October from Exeter Chiefs. The Wales Under-20 international left the Dragons for Bristol in 2014, and signed for Exeter four months later. "It is different here now compared to how it used to be, especially having the new training facility," he said. "We are a team on the up with all of the the players doing well and its only going to get better once we are back up to full strength with the return of the injured players." Hughes has scored one try in nine appearances since moving to the Dragons on loan, helping the Welsh region to five wins. At Bristol, he scored three tries in nine matches, but only made Andy Robinson's starting XV on three occasions. He had limited opportunities at Exeter, too, and felt he needed to move again to play more regularly. Dragons director of rugby Lyn Jones said: "This is great news for us as a Region. Adam has returned to the Dragons as a more confident and understanding player. "This is an important signing for us as we move forward." The Dragons' next match is the local derby with Cardiff Blues in the Pro12 at Rodney Parade on Sunday, 27 December.